Floral prints are definitely a new season trend. I’ve see them popping up everywhere and while a part of me sighs at the repeat of yet another fashion trend from my youth, hey, I can’t resist a bit of floral in my wardrobe. Yep these wild, floral prints have been around before. And particularly, this kind of floral print (with a black background) was HUGE in the 90s. I had a so many of these dresses back then! I was so grunge haha! Anyway, my biggest challenge was to try wearing this print in a grown up style – that is – without making myself cringe because I’m dressing like a teenager. 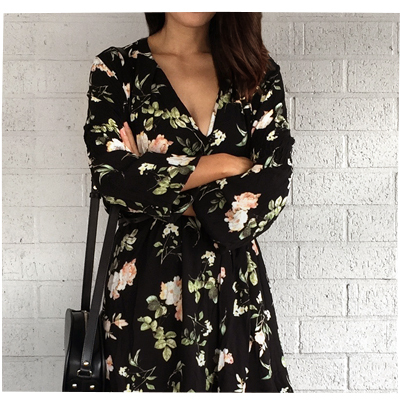 I picked out this Black Lantern Floral Print Dress, which was provided by Shein, as a sample for me to try out. Honestly I loved the print (it’s not overly busy), the sleeves, the v-neck (not too revealing), the nipped in waist and the flattering skirt. BUT I had to alter it slightly, because it was way too voluminous for me in the body and I didn’t like the choker detail. Specifically, I cut off some panels of fabric from the back. if you look at the photos of the original dress, you’ll see what I mean. It has a very easy-to-wear style, it’s comfortable, it’s very flowy, flattering and feminine and best of all it was only AUS$38 (US$28). The fabric is very nice too. Personally, I don’t think you should spend big on these floral dresses, so I recommend hitting up ASOS, Zara, Sportsgirl for your floral dress fix. Or here are some other pretty floral dresses from Shein – I was obsessing over whether to get this floral maxi dress (AUS$26) too. Also wearing: Over the knee boots from Betts, A.P.C. Half Moon Bag from Shopbop.